Ever since I can remember, my life has been filled with music. As a young child, I loved singing and listening to music. At the age of 8, my parents bought a keyboard and I started to teach myself to play the piano. I eventually went on to study music composition at the University of North Carolina, where I obtained a bachelor’s degree in music and communications. I am now a mother of three small children and singing and music are a regular staple in our house. My experience with my children inspired me to pursue a career that would allow me to share my love and enthusiasm for music with other children as well. 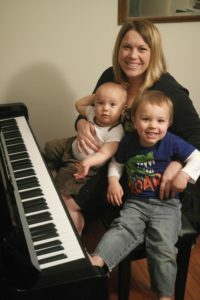 As a preschool music teacher, it is very rewarding to help toddlers and young children discover and cultivate their own love and talent for music. Not only are the classes fun and uplifting, but research and my own experience has also shown that music plays an essential role in the emotional and cognitive development of children. While listening to music has its own benefits, actively participating in creating music provides even greater benefits, rewards, and satisfaction. Early childhood music classes help ensure every child has the opportunity to be a musician and enjoy all the benefits music has to offer. It makes me feel good to know that by offering affordable musical programs, I have been able to increase the availability of quality music education for children attending Jacksonville daycares and preschools. Email me at Carrie@jaxmusicteacher.com or call me at 703-200-7362 for more information about the music programs I provide.